Re-invent the dentures category starting with innovative pack design! Most of us know what dentures are, haven’t given much thought to them, and think we don’t know anyone who wears them. But, a surprising 15% of the general population in North America & Europe wear dentures, and the average age of getting dentures is 45 years old! This means, statistically, that someone close to you probably wears dentures, and that it’s not reserved for an old elderly relative or professor. Typically when people think about dentures, they think about users who have all of their teeth replaced and require full top and/or bottom dentures. Many times, however, dentures are simply replacing a few teeth in a users mouth. These users have to care for both dentures and natural teeth in their mouth at the same time. 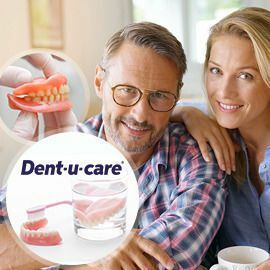 In either case, dentures aren’t a joy to wear, but they absolutely provide a real service to these users Dent-u-care, a brand in-the-making, would like to re-invent the denture category to make the entire denture experience better for everyone who chooses this option! Can you help? Create an attractive & positive pack design that is easy to understand on-shelf for a new Denture product. Participate in the contest before January 09th 23:59 UTC!